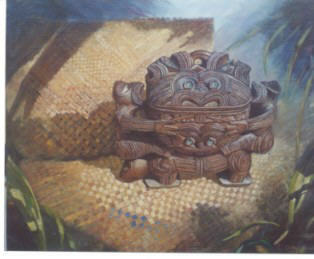 the wakahuia used for ceremony and storing treasured items. This one was for a wedding ceremony and elaborately carved with Gods of prosperity and fertility. 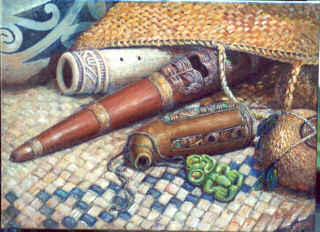 oil on canvas 26 ' x 30"
Various flutes used by Maori and the original Poi( ball on string) originally used for practice for war skills now in song and dance and are mostly white.